Before the history of plastics began, materials were not developed in the laboratory. Products were essentially natural materials like wood, glass, clay and, later, rubber and metals. We can trace the origins of plastic back to 1862 at the Great International Exhibition in London when Alexander Parkes presented his patented Parkesine, a man-made plastic derived from nitrocellulose. This material could be heated and molded into goods that could keep their shape after they were cooled. Six years later, New Yorker John Wesley Hyatt combined organic cellulose with camphor to produce celluloid. In addition to replacing the ivory used in billiard balls, celluloid became ubiquitous as the material used to make the film use for movies and still photographs. Smaller developments continued over the years using a variety of organic substances. But in 1907 the plastic revolution began with a fully-synthetic material that went on to become a successful commercial product. 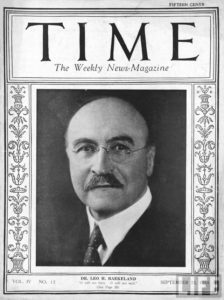 The inventor, Leo Hendrik Baekeland, is most often referred to as the father of the modern plastics industry. His product, Bakelite, was made by combining heated phenol with formaldehyde to produce a condensation reaction that generated the first polymer resin. The chemical name for Bakelite is polyoxybenzylmethylenglycolanhydride. The creation of plastics opened up a whole new world of possibilities for manufacturing. It’s not an overstatement to say that plastics helped produce a manufacturing revolution that affected almost every area of our lives. Kitchen utensils, telephones and automobile parts are just a few of the everyday products that rely on the plastics manufacturing process. Nearly every modern industry has some connection to plastics. Medical devices, clothing, upholstery, electronic gadgets and home appliances are just a few of the sectors where plastics have become a specialty. The history of plastics is one of continued improvement and evolution and is is a leading material in many fields. Innovation, as well as environmental challenges, remain. And where once it was nearly impossible to imagine a world with plastics, it is currently nearly impossible to imagine a world without them.